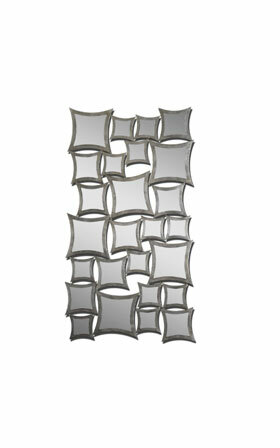 This unusual mirror features numerous, separately framed mirrors all attached to create one. Frames have a lightly antiqued silver leaf finish. May be hung either horizontal or vertical. Finished in brushed aluminum and red Bold and sleek design that will energize your home Hand crafted and hand finished Easily hangs on wall for stunning effect. While many of the items are on display in our store and in stock. Please contact us for availability and pricing information. Each line weaves its way around the next, never quite touching. Elegantly crafted, the Layna Sculpture is an excellent addition to any room. Call for colors available.